Home Music	J Cole is K.O.D. 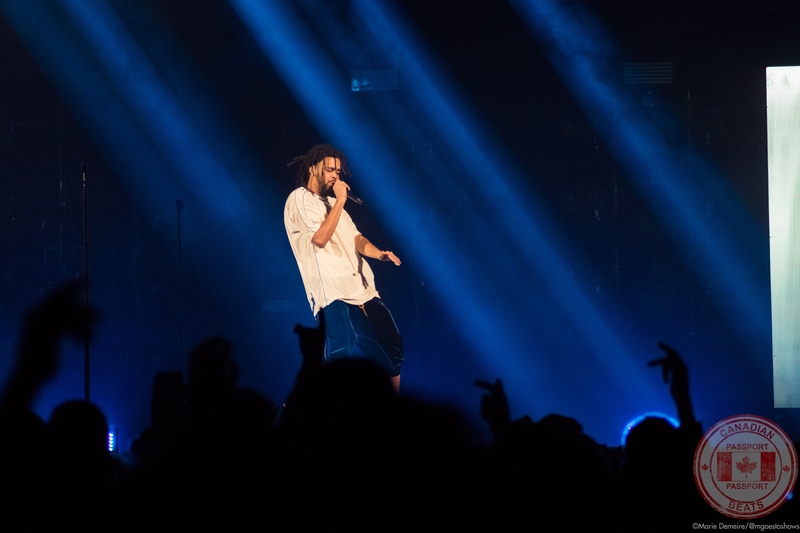 The Bell Centre filled its seats on Oct. 5 as eager hip hop fans gathered for the last leg of J. Cole’s K.O.D. tour, joined by special guests EarthGang and Young Thug. While EarthGang started off the night by performing a quick set of their biggest songs, it was clear as the building packed up that many fans were eagerly awaiting Young Thug, fresh off the release of his compilation album Slime Language, with his label YSL, and his own EP, On the Rvn. The crowd was evidently excited as well as surprised that Thug actually made it into Canada, considering recent run-ins with the law that left him with eight felony charges including intent to distribute illegal narcotics and possession of an illegal firearm. Given his extensive catalogue, Young Thug had no problem picking out the crowd-pleasers that would maintain hype throughout his whole set. Opening with “Anybody” off his early 2018 Hear No Evil EP, Thug may have only chosen two songs throughout the whole set that appeared on the same album. Showing that he has released hits year after year with no shortage, the Atlanta rapper played newer tracks such as “Killed Before” and his guest verse on Drake’s “Ice Melts,” yet surprisingly stayed away from the newest tracks in his catalogue. The rapper finished his set with some of his biggest hits, including “Pick up the Phone” featuring Quavo and Travis Scott, and his break-out hit “Bestfriend.” Finally, Thug’s long-time producer, London on da Track, was brought out to finish strong with “Lifestyle,” the song that put the Rich Gang signee on the map in 2014. The lights dimmed as the spotlight shone a purple light on a large curtain covering the stage that listed the meanings of the acronym K.O.D. As the curtain fell and revealed the simple stage with hovering cloud-like “K.O.D.” balloons, Cole emerged from an underground staircase to the album’s “Intro,” leading then into “Window Pain (Outro),” while the crowd roared. A few songs into the set, Cole sat down to explain the three meanings behind the album name K.O.D. “Kids on Drugs,” which represents the times we live in, when we often find ourselves escaping our problems with the scapegoat of our choice. “King Overdose” refers to Cole’s personification of himself from whenever he has used drugs to escape his past. The final meaning, “Kill Our Demons” is what he said he “hopes for everyone to one day achieve,” by facing their demons in a safe and healthy manner. The explanation led into “Photograph,” the third song from the album. This was far from Cole’s last speech of the night. After playing various songs from his prior albums, 4 Your Eyez Only and 2014 Forest Hills Drive, the North Carolina rapper stopped to boast a humble brag. Explaining that the journey is the best part of any success story, Cole spoke about how Twitter users doubted him back in the day, saying that although he was good, “he can’t make a hit.” “But now,” Cole went on to say, smiling at a roaring crowd, “I think I got a few hits.” The stadium erupted in cheers and applause as the beat to “Workout” began, the 2011 single that first established Cole’s credibility in the rap world. Following hit after hit, Cole’s most inspiring speech lasted almost five minutes and was his last of the night. He said the one thing that “determines if we are healthy or not comes down to our ability to process and deal with pain.” Cole said that everyone in the world has felt pain and questioned why no one has been shown how to properly process it. As we grow up and witness traumatic events, he explained, pain grows within us and we do not know how to rid ourselves of it. Cole ended with words of inspiration, urging everyone to go out into the world and deal with their baggage as soon as possible, in order to live their most fulfilled life. He finished the speech by singing “Love Yourz,” his “own personal reminder and favourite song” that puts him back on track in the most dire of times. The rapper faked an ending by bidding his fans farewell after performing “KOD.” As the crowd continued to cheer, even with the lights off, Cole came back out to perform his encore—“1985,” a diss song to new-wave rappers in which he delivered an a capella verse. He finally finished with “No Role Modelz.” As Cole thanked his fans for coming to listen and walked off stage, the crowd dispersed feeling a mix of both inspiration and excitement as they poured onto the streets of downtown Montreal on a beautiful Friday night. Photos by Marie Demeire for Canadian Beats.